The release date for Nikon’s much-anticipated KeyMission 360 camera has been pushed to October 2016, according to an official announcement from Nikon. Nikon attributed the delays to the need to work on the software. It is not clear from the announcement whether Nikon is referring to the internal software of the camera (e.g. for stitching) or to the editing software, or both. 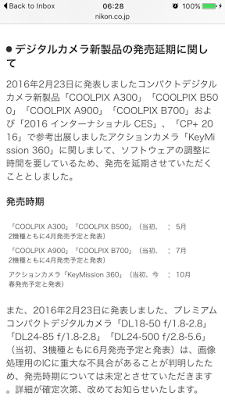 In January’s CES, Nikon previously announced that the KeyMission would be released in Spring 2016. For related posts on the KeyMission click here or in the related label/tag (below the sharing buttons).